butterfly magnets Archives | Happy Deal - Happy Day! 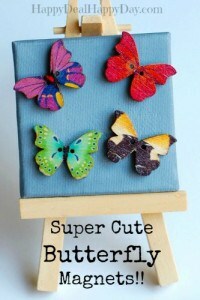 Cute and Colorful Butterfly Magnets! Magnets For Sale – Use on your fridge, lockers, or magnetic photo frames!! 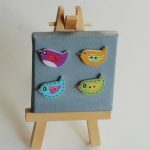 If you didn’t see this post a little while back then you missed my news: I’ve branched out my online business and have a handmade shop called Magnet Menagerie!! I’m selling both on Etsy and Amazon. 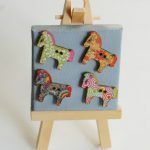 I love doing DIY craft projects – so I decided to put some up for sale!! So far my shop includes a variety of decorative refrigerator magnets and magnetic photo frames. The cool thing about them is that I made them using rare earth magnets – which means they are much STRONGER than normal fridge magnets. Once I did, I realized how much fun it was, and came up with all sorts of different ideas and styles. Way more than just my fridge can hold! 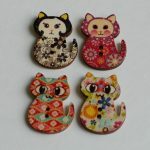 So that’s why I decided to open up my Amazon Handmade Shop – Magnet Menagerie! Most of my sets of 8 are just $6.75 including free shipping – another Happy Deal! I stumbled upon these unique wooden butterfly buttons pictured above that I turned into magnets! These would be super fun to have in a locker – awesome Back-To-School purchase! These also happened to be my #1 seller at craft fairs this year!!! There were many verbal comments on how cute these are!! 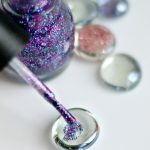 Check out this post here on how to make glitter glass magnets!